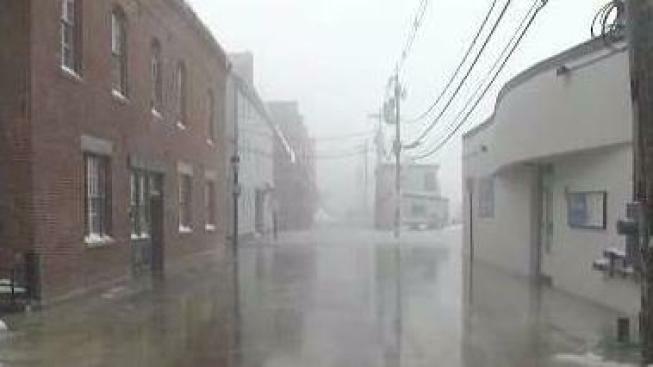 Maine residents dealt with heavy snow and flooding Thursday. Not even a bomb-cyclone blizzard can stop Mainers on a mission. Even in blizzard conditions, people were sledding, cross country skiing, and fat-biking through Portland. "We don't live in New England to be warm and comfortable all the time," said Seth Levy, biking down Congress Street Thursday afternoon. Maine's largest city recorded more than 10 inches of snow, and achieved blizzard conditions by 3 p.m.
At 15 inches, Turner appeared to receive the most snow by Thursday night. Wind gusts as strong as 47 miles per hour hammered Maine’s coast, and ushered in high tide that caused coastal flooding at 12:30 p.m.
From Kennebunkport, to Port Clyde, to Portland’s waterfront, low-lying areas experienced flood waters that were slow to recede. "We've never seen flooding quite like this," said Portland resident Herb Ivy, who couldn't get into his home due to the flood waters on the Portland pier. "I can't get home, and my family is inside the condo and they can't get out." At the height of the storm, more than 5,000 customers lost power across Maine, but power companies were quick to restore many of them. Portland Public Works Director Chris Branch said his concern has turned to Friday and Saturday, when a blast of arctic air returns. When temperatures fall below 15 degrees, road salt is not effective. "Worst case scenario, we'll just have to switch over to sand," he said.